So much harder than I thought…. I’m realizing, on day 4, that the two things I’ve tried to successfully tackle so far I’ve completely failed at. I should know better than to be cocky about already being healthy and not really needing to lower my sugar —or at least it not being all that hard. Turns out, it’s HARD. Not because I’m trying to grab cookies and candy, but because sugar is literally in everything! I’m realizing that even all the healthy stuff I buy has sugar in it. What the what? I know I’ve heard it a million times…American’s are addicted, sugar is in everything, but I really did have a false sense of protection because I’m buying what appears to be healthy, organic products with minimal natural ingredients. My normal "go-to healthy snacks” have all had sugar. Veggie snacks, my sunbutter, my jam, the priobiotic yogurt drink, the gluten free Milton's crackers, my vitamin gummy (to be fair these really do taste more like candy and I probably DID know they had sugar). That’s just the stuff off the top of my head. I’ve had to really look at everything I’m eating, because so far I’ve NOT lived up to the challenge …mostly because I’m already eating voraciously by the time I’ve bothered to read the ingredients. I’m going to try not to repeat this mistake tomorrow. I’ve done some digging on possible “sweet treat” substitutes….because I’m a cycle sweets eater for sure. Around my period, that’s when I crave Ben & Jerry’s, or chocolate, or really anything sweet. I find pints of B & J toffee ice cream after period week in the freezer with nothing left but some sad looking lonely vanilla because in some late night sugar craze I’ve picked all the toffee out. Every piece. It’s not pretty and it’s isolated usually to period week, but let’s face it, that’s 25% of the month, there’s no ignoring it. I’m gathering all my workout bottoms in one place (which seems like it should already be the case, but is not). I’m pulling out each pair, and literally smelling them (sometimes they get a mildew smell because they are wet and don’t get washed right away), checking to make sure they aren’t so faded they look like homeless pants, and making sure they aren’t already partially destroyed by washing them wrong. (I’ve made some poor washing decisions in the past…like washing fluffy linty cotton towels with my supplex). I’m doing the same with all my tops/jog bras and workout tees. Workout tees get gross SO fast. It doesn’t take long, so do yourself a favor and retire the questionable ones. One thing I realized is that while I have a pile of workout bras, I really only have ONE that I love, and I’m always looking for that ONE. I’m retiring the others, because they don’t really fit well, they are either too tight or too loose, and I’m buying myself some new ones. I bought myself a new water bottle. Why? Definitely not because I “need” it, I have two that I love. I did it because I dig this new Swell bottle (because it keeps things hot too), and it’s small (and I don’t really end up drinking much during my workout because I’ll have to pee and after 4 kids that means I spend the whole workout trying not to pee). Most of the times I have the thing in my purse so I want it to be lightweight too which this one is..
Having your workout stuff easy, ready to go, and stuff you love to wear makes working out more tolerable. I pretty much hate exercise, hate. But I do it with religious commitment (mostly because if I don’t I’ll fall off the wagon super easy and it’ll all be over). My workout clothes are the best part of the entire thing, besides the satisfaction of getting it done, and the general enjoyment at not having super squishy thighs and turkey arms. Mind you, I used the word “super squishy”…my bar isn’t really even all that high because a little squishy is just fine with me. It's back to school for many this week and for us that usually means an influx of girls looking for a brand new pair of jeans. New jeans are the best way, in my opinion, to boost your confidence. They make you feel great and they're an instant staple in your wardrobe. 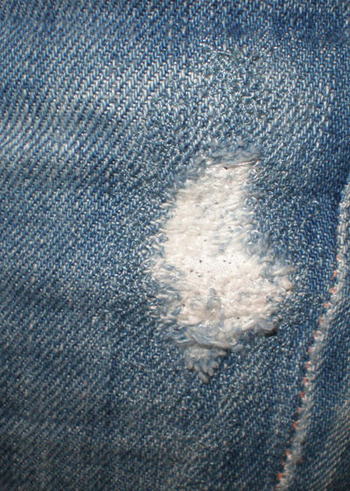 The worst thing you can do though, is not get your jeans hemmed properly. I'm not sure why anyone would spend so much on designer jeans and not spring for the extra $15 to get the original hem at the correct inseam. In fact, we believe so strongly about original hems that we now offer FREE HEMMING to all of our IN-STORE customers... come see our smiling faces in person and we will not only put you in the perfect pair of jeans for your bootie, but we will also hem them for free. Food coloring stains be gone! PS! Speaking of Sevens.... we just got a brand new shipment with 3 new styles and restock on the high waisted bootcut in LA Dark!! Check them out here. 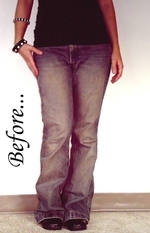 Before and After- Jean Makeover! In the past I always bought my jeans too big thinking I’d probably shrink them in the wash. Also, I’ve always thought tight jeans were uncomfortable. What, of course, ended up happening was my jeans would stretch out, not shrink, and thus I would end up with jeans that were way too big. At Melange we always recommend people buy jeans that feel a little too small when they first try them on. If they feel tight when you first buy them, they will probably feel perfect after they stretch out about a half size. Feel free to check out our Jean Bible for more helpful jean fit tips!